Sixteen-year-old Jules Verity knows exactly what’s in store at her new job at castle-turned-dinner-theater Tudor Times. Some extra cash, wearing a fancy-pants dress, and plenty of time to secretly drool over the ever-so-tasty–and completely unavailable–Grayson Chandler. Except that it’s not quite what she imagined. For one, the costume Jules has to wear is awful. Then there’s the dead body she finds that just kind of…well, disappears. Oh, and there’s the small issue of Jules and her episodes of what her best friend calls “Psychic Tourette’s Syndrome”–spontaneous and uncontrollable outbursts of seemingly absurd prophecies. K.C. Held’s debut novel Holding Court is laugh out loud funny and vivacious. I started and finished this novel in the same day. I was also at the gym while reading and, let me tell you, no one wanted to get on the elliptical next to me because I looked like I was crazy. I couldn’t stop laughing. Held’s writing is snappy, whimsical, and absolute. The plot moves along quickly, keeping the reader satisfied, but also, at the same time, wanting more. I couldn’t figure out who the murderer was and the way the story winds, there were potentially three or four people who could’ve done it, including Jules herself. The characters are characters themselves. Jules comes from a family with “gifts”. An aura reading, matching-making grandmother. A mother who can determine if an antique is real and where/when it was crafted. Jules’ best friend is quirky, giving Jules the nickname Blurt- which suites her quite well. Grayson is charming in a squight kind of way. I would definitely recommend this to anyone looking for a funny, thrilling, off-the-wall read. At the beginning of Holding Court I was a little hesitant because I did not get what was going on. Part of the reason was that I just dove into the book without reading the synopsis. Did not know the main character was psychic so it was a huge surprise when it was mentioned in the book. I really really like Jules. She is funny, down to earth, and did I say she is hilarious?! Her love obsessions opened the door to many hilarious occurrences and went perfectly with the murder mystery we had going on in the story. I wish we had an epilogue, but I guess I can be okay with what we got. It was a good ending. But I wanted MORE. Overall, if you are looking for a hilarious fun read, look no further. Holding Court is everything you didn’t know you were looking for! K.C. HELD was born and raised in California with stopovers in Honduras, Mexico, and France. Married to her high school sweetheart, and mom to two avid bookworms, she holds an MFA in costume design and is an accomplished seamstress with a background in opera, theater, film, and television. Although she once spent a summer working in a castle, there were no dead bodies involved. Just an FYI, K.C. Held is an awesome person in general! Go buy her book! I’d like to thank NetGalley and Entangled Teen for the opportunity to read this ARC. Receiving this ARC for free does not influence my review. Beth Fremont and Jennifer Scribner-Snyder know that somebody is monitoring their work e-mail. (Everybody in the newsroom knows. It’s company policy.) But they can’t quite bring themselves to take it seriously. They go on sending each other endless and endlessly hilarious e-mails, discussing every aspect of their personal lives. Meanwhile, Lincoln O’Neill can’t believe this is his job now- reading other people’s e-mail. When he applied to be “internet security officer,” he pictured himself building firewalls and crushing hackers- not writing up a report every time a sports reporter forwards a dirty joke. When Lincoln comes across Beth’s and Jennifer’s messages, he knows he should turn them in. But he can’t help being entertained-and captivated-by their stories. By the time Lincoln realizes he’s falling for Beth, it’s way too late to introduce himself. The only RR book I had read so far is Fangirl and I wanted to check out RR’s adult fiction work. I was expecting her writing to be similar to Fangirl, but still be different if that makes sense. I honestly did not know exactly what to expect. Really, I can only fangirl in this review. I stayed up until 12:30am last night just to finish this book. The last time I remember looking at the clock was around 10:20ish. I said to myself I’ve got time to read a little more… and a little more turned into finishing the book. You all know how that works. Back in late October/November I read about 30 pages in a span of a week and it depressed me a little so I stopped. It was nothing like Fangirl and I knew the next time I picked this book up I had to be in an adult fiction mood. And that mood hit me last night. 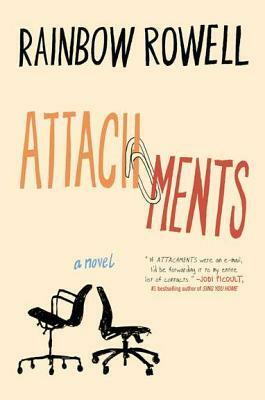 Here are some of the reasons why I loved Attachments so much. #1 The friendship between Jennifer and Beth. The bond between these two is perfect. The way the talk, their jokes, how considerate they are of each other, and how real they are. It’s just one of the best friendships I’ve seen on paper. I just really love this bunch of married nerds that play video games once a week you can say almost religiously. They always accept Lincoln into their gaming family. Seriously, they are this big eccentric and weirdly awesome family. Oh, Lincoln. What have you done to my heart. I’ll love you for who you are. I promise. This woman cracks me up! With her stories about her marriages and life, she was exactly what Lincoln needed to stay at The Courier long enough to… figure things out. Yes, let’s put it that way. I don’t want to spoil you all! Oh Dear Lord, that ending was just… perfect. The ending of this book left me on Cloud 9. I felt weightless, happy, and content. Just picture this: you know that warm feeling you get when you eat a really good meal and it just sits right? And you feel full, happy, and content? That’s exactly how I felt at the end of this book. I need more endings like that in my life. Louisa Clark is an ordinary girl living an exceedingly ordinary life—steady boyfriend, close family—who has barely been farther afield than their tiny village. She takes a badly needed job working for exMaster of the Universe Will Traynor, who is wheelchair bound after an accident. Will has always lived a huge life—big deals, extreme sports, worldwide travel—and now he’s pretty sure he cannot live the way he is. 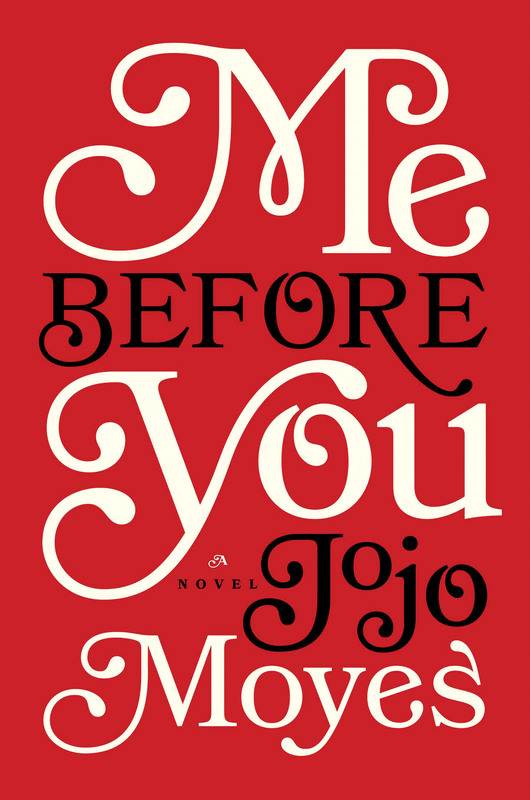 A Love Story for this generation, Me Before You brings to life two people who couldn’t have less in common—a heartbreakingly romantic novel that asks, What do you do when making the person you love happy also means breaking your own heart? At first, I didn’t think I would love this book. I was a little put off because I imagined a 20/40 age thing, but I am so happy I was wrong. Oh My, Me Before You just blew me away. I don’t know if it was because I had no expectations when it came to this author or that I knew nothing of the story, but I fell head over heels with this book. In the first few chapters as the author was setting the stage, I was a little bored. I believe part of the reason for that was because I am not from London, nor am I English. Reading a book set in England, with English characters who are culturally and geographically English kinda threw me off at first. In a way I could explain it as I was culturally shocked. I got over it pretty quickly though. Will and Lou are the main characters in this story and the antagonist in the book would be Will’s disability. As stated in the synopsis, Will was leading a very normal life for a man of his stature until the day he was a pedestrian victim of a motorcyclist accident. Lou on the other hand is a average, drama-free 27 year old girl who has the burden of supporting her entire family and carries a dark secret that no one knows. Two unlikely people meet under very unfortunate circumstances, but something heartbreakingly beautiful comes out of it. The themes of pain, friendship, loyalty, and the very controversial topic of assisted suicide are seen constantly through the novel. As I was reading the story, I felt everything Lou felt. Every discovery, every high and low, I felt it all. We do get to see the POV of a few other characters throughout the book, but for the most part, we see everything through the same lens, through Lou. The Epilogue made my chest feel tight with emotion, and to bear with the bittersweetness of it all I have created an alternate ending to the book where I get the ending I wish I would have gotten. Me Before You does not have a bad ending, I just wanted something else. Overall, this book surprised me. It made me love a whole new world, and become attached to a bunch of characters I normally wouldn’t meet. Me Before You was beautifully written. Disclaimer: I do not want to spoil this book for anyone, but without spoiling it I will say that I am not for assisted suicide. I may be judged harshly for this statement, but that is my answer to this touchy subject. I may understand why people do it, but I do not condone their actions. I was given a copy of this book through Net Galley. The description of the story was very promising which led me to request it. I started reading the book once I was approved, but after the first 30 pages everything started going down hill. I am sad to say that after trying to read it for over a month, I can’t make myself finish the book and I will write a review on what I’ve read so far. I really wanted to like this book but I couldn’t. It’s not the end of the world. That’s what 39-year-old Tess Eliot has to remind herself after losing her newspaper column (“Tess Knows Best”) and being dumped by her boyfriend for a younger woman (a feng shui expert? Really?). 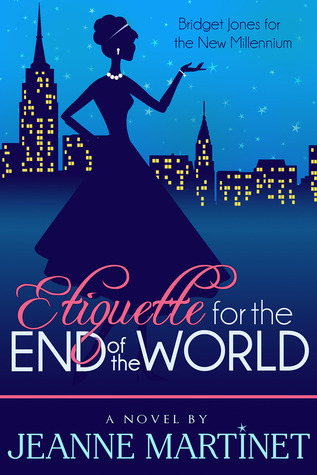 Then Tess is hired to write an etiquette guide preparing readers for the Ancient Mayan doomsday of December 21, 2012, and she has to ask herself: Could the world really be coming to an end? At first, Tess fakes her way through chapters like “Boundaries in the Bunker” and “Cannibalism: Yes or No?” But after uncovering a secret plot for world destruction, she is forced to embark on a life-changing odyssey of her own—involving all-too-close encounters with touchy-feely survivalists, conspiracy theorists and one handsome guy who seems way too perfect. I like that the book wasn’t badly written (as in I did not find any grammatical errors). I also liked the idea that was being marketed. The title makes you want to read the book and I like that. If this book would had been executed better, I would have been a fan of it for a long time. I did not like the characters in the story or how the plot was developed. The main character at first was someone I could be friends in real life and I kind of liked, but soon she started changing into something I could not stand. There are plenty of stories I’ve read with bad characters, but somehow you come to like them but Tess was one of those characters who I wanted to scream at and say, “Get a life! Grow up!” The only character I liked was Tess’ old boss who helps her obtain side jobs and in a sense is her advisor. I didn’t like the book and I couldn’t make myself finish it. What upsets me is that I requested a copy of this book to review it and I will be giving it a bad review but it happens. Everyone has a time where they have this awesome idea but it is poorly executed and it ends up being a mess. I am not bashing her writing but this story could have been better executed. It had so much potential for being great.